The major features of the Tankerhoosen Valley are listed with a brief description - tracts, tributaries and ponds. Each will eventually be described in more detail with photos and links for more information. Click the map to locate features. Gages Brook and its associated southern tributary comprise the headwaters region of the watershed, eventually flowing into Walker Reservoir East. Gages Brook is located in the northwest portion of the Town of Vernon and within the western portion of neighboring Tolland. A few small impoundments are located within the Gages Brook watershed. The brook receives drainage from the I-84 corridor near the Vernon-Tolland town boundary. In Tolland, Gages Brook flows through an industrial park and residential areas. This area poses the largest threat to the river with its commercial and residential development. The Exit 67 area will be developed further and must be watched to ensure responsible development. Walker Reservoir is no longer an active public water supply but rather a recreational resource that attracts hikers, fisherman, and ice skaters. The Tankerhoosen River originates at the outlet of Walker Reservoir East. Gages Brook flows into Walker Reservoir East. Construction was completed in 1900. At normal levels it has a surface area of 15.6 acres. It is owned by Town Of Vernon. Walkers Res. East is rock fill. Its height is 14 feet with a length of 240 feet. It drains an area of 2.97 square miles. Barrows Brook, Rickenback Brook, and several other small tributaries drain the eastern portion of the upper Tankerhoosen River watershed between Walker Reservoir and the confluence with Railroad Brook near Webster Pond. Barrows Brook is the furthest upstream tributary to the Tankerhoosen River and flows through the DEEP's Tankerhoosen Wildlife Management Area. Rickenback Brook flows east to west through a relatively undeveloped portion of Vernon and discharges to the Tankerhoosen River approximately 0.4 miles upstream of the river’s confluence with Railroad Brook. Portions of this brook are within the Belding Wildlife Management Area and have been established for catch and release trout fishing. Railroad Brook drains the southern portions of the watershed, beginning at Bolton Notch Pond in Bolton and flows north through Valley Falls Park and the Belding Wildlife Management Area before joining the Tankerhoosen River. Valley Falls Pond is located along Railroad Brook within the confines of the Valley Falls Park property. Railroad Brook flows through primarily undeveloped land and discharges to the Tankerhoosen River near Bread And Milk Road. Clark's Brook and Tunnel Brook join the Tankerhoosen River in the middle portion of the watershed prior to the river reaching Tunnel Road. Clark's Brook originates north of I-84 and drains primarily industrial/commercial and undeveloped land within the Town of Vernon. Clark's Brook discharges to the Tankerhoosen River approximately 0.5 miles upstream of the river’s confluence with Tunnel Brook. Tunnel Brook is located in the central portion of Vernon, flowing north to south and crossing the I-84 corridor. The brook empties into the Tankerhoosen River just before it reaches Tunnel Road. Tankerhoosen Lake is used for recreation purposes. Construction was completed in 1830. Its normal surface area is 16.5 acres. It is owned by DEP. Its dam is masonry, of earthen construction. Its height is 16 feet with a length of 237 feet. It drains an area of 10.95 square miles. Tillinghasts Brook, which drains much of the Lake Street area, parallels Washington Street and joins the Tankerhoosen River just before Dobsonville Pond. It also forms the small pond on Phoenix Street near the Tankerhoosen Lake dam. Dobsonville Pond is located just downstream of Tankerhoosen Lake and is used for recreation purposes. Construction was completed in 1900. Its normal surface area is 5.5 acres. It is owned by DEP. Its dam is masonry. Its height is 26 feet with a length of 84 feet. It drains an area of 10.7 square miles. Tucker Brook, which drains the southeastern portion of the watershed and a residential section of the Town of Manchester, joins the Tankerhoosen River immediately upstream of Dobsonville Reservoir dam. This is the last stream of any size that flows inte the Tankerhoosen. Just below the Dobsonville Dam is the Talcott Ravine (formerly known as the Talcottville Gorge). The dam area and ravine are the sites of Peter Dobson's mills and is one of the most scenic and unique feature of the river. The ravine property is now owned by the Northern CT Land Trust. Further downstream is Talcottville Pond and the confluence with the Hockanum River near the Vernon/Manchester town line at Golfland. Generally, the designated 100-year floodplain of the Tankerhoosen River is confined along a narrow corridor (greater than 500 feet wide) surrounding the river. The undeveloped lands and protected open space in the upper reaches have sustained important State of Connecticut natural resources the 300-acre Belding Wildlife Management Area and the 450-acre Tankerhoosen Wildlife Management Area. 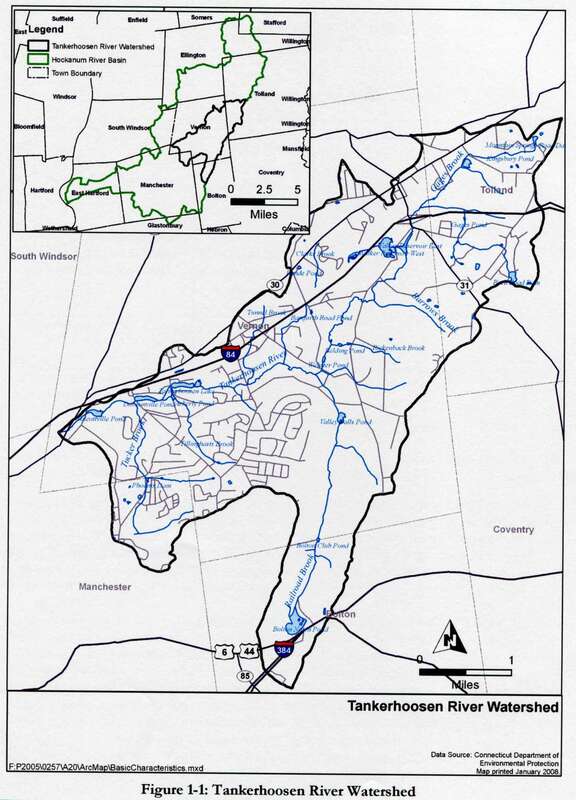 These areas is managed by the CT Department of Environmental & Energy Protection, and is one of only two such areas east of the Connecticut River. The second area is on the Salmon River in Colchester.